A new, exciting year has just started for Catalonia, European Region of Gastronomy awarded 2016 that is ready to kick-start a full programme of initiatives in the framework of 2018 European Year of Cultural Heritage to celebrate local and European cultural richness. IGCAT attended the opening ceremony of the Year that took place on 16 February 2018, on the ravishing background of the Sant Pau Art Noveau Site in Barcelona, declared UNESCO World Heritage site in 1997. Promoted by the European Parliament and the Council of the European Union, the European Year of Cultural Heritage aims “to encourage more people to discover and engage with Europe’s cultural heritage, and to reinforce a sense of belonging to a common European space,” as specified on the European Union official website. In line with the general objectives of the European Year of Cultural Heritage, Catalonia aims to bring Catalan population closer to their cultural heritage; raise awareness on the importance of safeguarding heritage and preserving it for future generations; integrate heritage and cultural tourism into a more sustainable development model; and ensure that the protection and promotion of heritage benefit all citizens and territories in Catalonia. 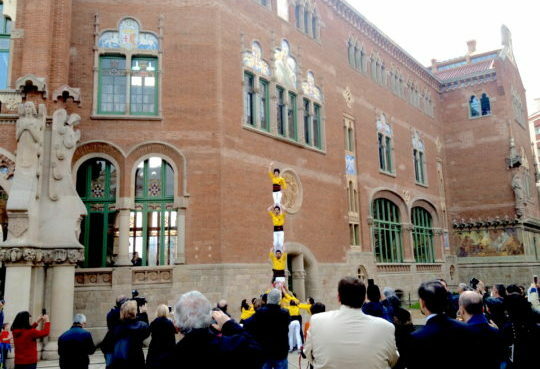 The Government of Catalonia (Generalitat de Catalunya) and its Department of Culture committed to implement an engaging yearly plan focused on the development, protection and promotion of Catalan tangible and intangible cultural heritage at both local and international level, thus contributing to celebrate and preserve Europe’s cultural diversity. This effort will be supported by the Catalan Tourism Board that announced 2018 as the Year of Cultural Tourism in Catalonia with the main purpose of strengthening the connection between culture and tourism in order to ensure social and economic sustainability of Catalan cultural heritage. Attended by different stakeholders and actors from the cultural sector, the opening act of the European Year of Cultural Heritage included interventions by: Director General of Tourism, Octavi Bono; Director of the Representation of the European Commission in Barcelona, Ferran Tarradellas, who underlined the vital role younger generations play in keeping intangible cultural heritage alive; Secretary of Environment and Sustainability at the Department of Territory and Sustainability, Marta Subirà, who highlighted the importance of landscape as an essential part of cultural heritage; and Secretary General of the Department of Culture, Maria Dolors Portús. Portús identified culture as a key element of social cohesion and defined the European Year of Cultural Heritage as an inclusive and participative action designed to involve the highest possible number of stakeholders. She also stressed the need to champion sustainability in order to contrast the currently predominant mass tourism model and favour a more balanced economy. She concluded stating that the safeguard of cultural heritage is key to a fairer and happier society. The opening event included a castells performance and a tasting of food from the Mediterranean diet, both part of UNESCO Intangible Cultural Heritage List since 2010, as well as a music performance of Catalan rumba whose candidature as UNESCO Intangible Cultural Heritage is currently under development.